Ken Swan estimated that it takes 60 hours to build this 13' Nez Perce Fishing Skiff, but it took Mike Fuller 600 hours. 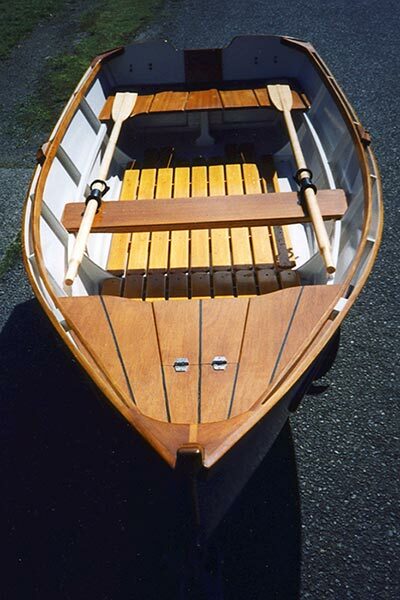 Mike used marine plywood for planking, covered the bottom with 6 oz fiberglass and epoxy, used African mahogany for the frames, and Philippine mahogany for the seats, and yellow cedar for the floor boards. Mike Fuller credits the WB bulletin board with great help in choosing which boat to build. He also received much assistance from Eric Sandilands, a teacher at Cowichan Bay Maritime Center, in British Columbia, Canada. He highly recommends that Cowichan Bay and WB join forces for some project. Reach Mike at mikeflyshop@sympatico.ca.